Domenico Codispoti is an Italian man under house arrest for a variety of crimes, including petty theft and drug dealing. Signor Codispoti, 48, is homeless. Every night at 9pm, he settles down in front of number 22 Via Vittor Pisani in Milan and arranges his blankets and sleeping bag. He isn't allowed to move until 7am the next morning. Police patrols check after sunset to make sure he's "at home." "I have always done my stealing at night," he says. "That's why the court gave me this sentence. Since I don't have a house, there was no other solution left. During the night I can't move, I have to stay here, stuck on this sidewalk." The unusual punishment was first imposed on Codispoti in 2006, when he was sentenced to two years of surveillance and house arrest. After a few more run-ins with the law, Codispoti's sentence was extended. 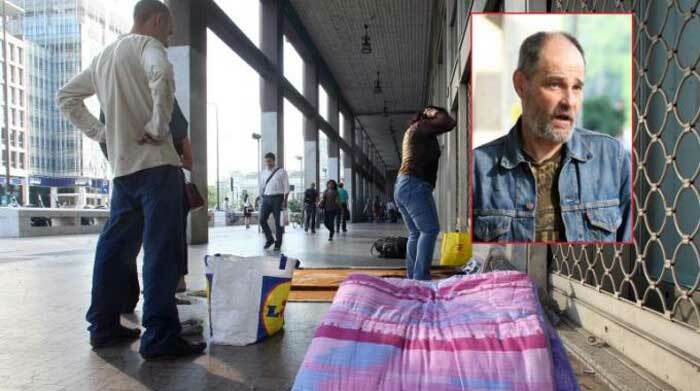 He must now sleep in this particular spot near Milan's Central Station until April 2014. He should just start building a structure.